Disqus, a provider of comment features for many blogs, including this one, has announced a hack. Information on people who used Disqus between 2007 and 2012 is at risk. Additionally, passwords (hashed using SHA1 with a salt; not in plain text) for about one-third of users are included. Thankfully, my blog wasn't yet up at that time, but it's little comfort to those whose information was exposed. As a security precaution, we have reset the passwords for all affected users. We recommend that all users change passwords on other services if they are shared. 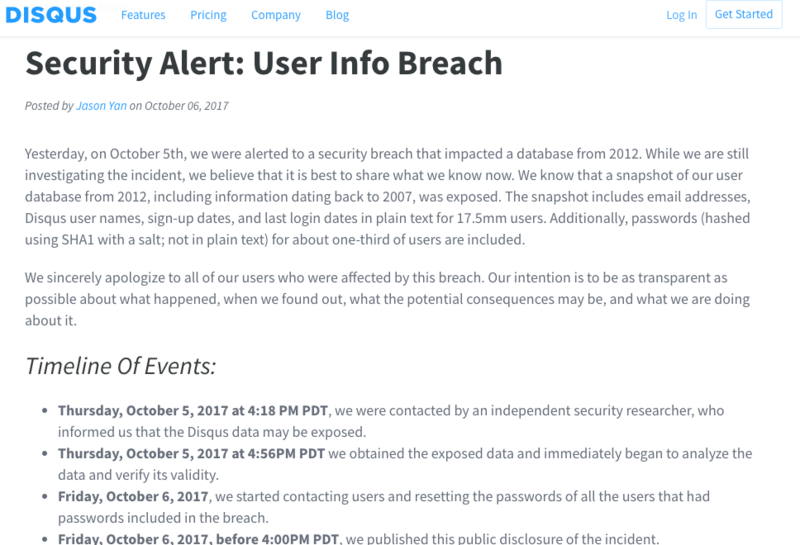 Thanks to Troy Hunt of HaveIBeenPwned for letting Disqus know about the breach! See my previous article about using HaveIBeenPwned to see if your account has been compromised here.